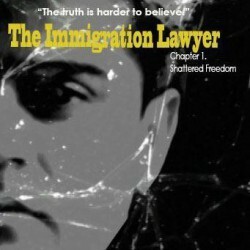 The Immigration Lawyer: Asylum by Shah Peerally is fiction story depicting life in post 9/11 America. In a bid to escape the political injustice and the torture he had been subjected to in his country, Ahmad travelled to America to visit his family and hopefully escape the torture back home. Unfortunately, his entry into the 'promised land' did not go past the airport, where he was detained and taken to a maximum security prison. Sarah is a brilliant lawyer who has just left corporate law, looking for something more fulfilling and Ahmed's case could not have landed into the hands of a more dedicated lawyer. Sarah believes her client is innocent, and with the help of a few other people, dedicates herself to making sure he gets the freedom he deserves. The Immigration Lawyer is a touching story about the life of Muslims in America after the tragic 9/11 attacks. Shah Peerally, through this story of a man's search for freedom and justice, shows how 9/11 changed the way people looked at Muslims, especially in America, forgetting the rule of innocent until proven guilty and replacing it with guilty until proven innocent. The book also tells the stories of the brave men and women who go above their call of duty every day to see that justice prevails. It is a touching story with a brilliant plot, showing a country pushed into an era where the need to ensure national security compromises the requirement to ensure justice for all.